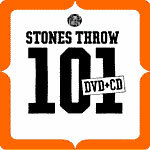 The first ever Stones Throw DVD! Featuring videos from Madlib, Madvillain, Jaylib, Rasco, Gary Wilson, Breakestra and more! Also comes with a 40 min CD celebrating the label's first 101 releases including hits, misses and previously unreleased material.